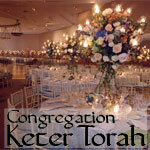 Keter Torah's social halls can be transformed into elegant settings for dining and dancing. Get more for your wedding! Don't forget to mention ChossonKallah.com when visiting Congregation Keter Torah.